A satirical pack of playing cards has been widely circulated by activists brave enough to criticize the regime. The cards have provided comic relief for Zimbabweans, lampooning their corrupt politicians, but also highlighting the grim reality of a country in economic tatters. Click on each card to read more. The elegantly suited Robert Mugabe has amassed a great fortune during his 26-year reign. 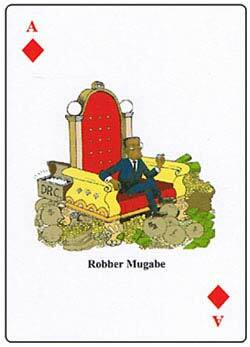 In this card, "The Robber Mugabe" sits on a royal throne surrounded by bags of money and gold. A treasure chest marked "DRC" is tucked behind the throne. This alludes to the money he has taken from the Democratic Republic of Congo using his strategic alliance with forces loyal to that country's president, Laurent Kabila. By backing his neighbor Kabila, Mugabe's family-owned companies were awarded a US$200 million contract and various mining rights in the Congo. In exchange, Mugabe lent troops and support to a war that is said to have claimed nearly 4 million lives.